Humorbot 5.0 is a robot comedian first shown at amateur nite but later became so popular that he was given his own talk show to host named Late Night with Humorbot 5.0. 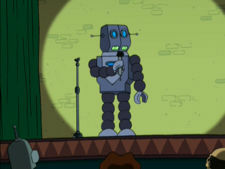 His show had such guests as All My Circuits star Calculon. The show Humorbot hosts is based on the Late Night Shows. Humorbot may not be one robot, but a class of numerous similar robots (such as Bending Units) which may explain their numerous appearances such as the broken one in "Bendin' in the Wind" and in "Raging Bender". He is shown to be a member of the League of Robots. His appearance is possibly a reference to David Letterman, based on his "teeth". Humorbot 5.0: So I said, "Super-collider? I just met her!" [audience laughs] And then they built the super collider. Humorbot 5.0: Anecdote accepted. Snappy comeback not found. This page was last edited on 3 August 2014, at 23:15.